Traditional at 9:30 a.m. - Biblical, inspiring, and relevant to today's life. Often includes special music. Contemporary 11:00 a.m. - This lively, family-friendly service features our worship band leading us in contemporary-style songs of praise. The Cribbery is open during all worship services and for many other special services. The Joyful Noise Room at the back of the sanctuary, provides a space where little children can "sing and wiggle" and parents can worship without undue concern. Coffee, tea, lemonade and bagels are served in the Fellowship Hall between each service...join us! Holy Communion is celebrated each Sunday at the 8:00 a.m. service and often throughout the year at the 9:30 am & 11:00 am services, and on certain other special days (Epiphany Sunday (January), the First Sunday in Lent, Maundy Thursday, Pentecost, July Summer Communion, World Communion Sunday, Thanksgiving Eve and the First Sunday in Advent). In the Presbyterian Church the Sacrament of Communion is open to all who claim Jesus Christ as their Lord and Savior. You do not need to be a member of this church to participate. Parents are encouraged to include their baptized children. Baptism is a high moment in Christian life, one which we regard with both seriousness and joy. 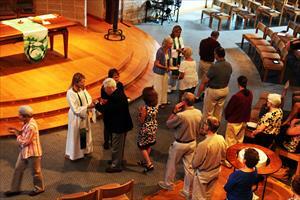 Presbyterians recognize baptisms performed in other Christian denominations as valid. 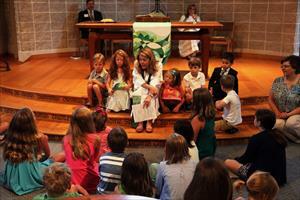 Members who wish to have a child baptized at Woods attend a baptism instruction class. Please call the Church office for more information.